In 2015, researchers used light-level geolocators to confirm the long-held assumption that Blackpoll Warblers make a nonstop flight south over the Atlantic Ocean each fall, from New England and eastern Canada to Caribbean islands and South America. The marathon flight ranges from 1,410 to 1,721 miles (2,270 to 2,770 km) and takes two to three days. Now another team of scientists has found that Connecticut Warblers make a similar flight. 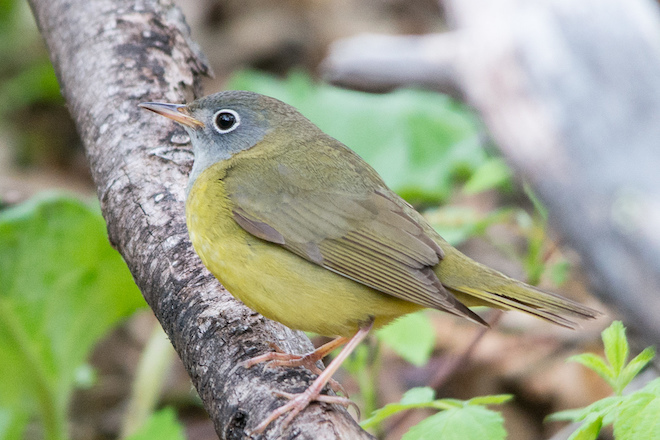 Emily McKinnon, a bird biologist at the University of Manitoba and a postdoctoral fellow at the University of Windsor, and her colleagues fitted 29 male Connecticut Warblers with geolocators at their breeding sites in Manitoba in June 2015. A year later, they recaptured four of the birds and studied the data stored on their devices. The trackers provided clear evidence that the birds migrate nonstop over the Atlantic for at least 48 hours from the eastern shores of the United States to landing points on Cuba or Hispaniola. Total distance: 1,050 to 1,490 miles (1,700 to 2,400 km). After a stopover of five to seven days, the warblers flew over the Caribbean Sea in a single flight, covering 375 to 500 miles (600 to 800 km), to South America. They then continued farther south into the Amazon basin.